We’re sometimes asked “why do you have an office in Edmond, Oklahoma?” With so many of our customers located in the New York Metro area, it may seem an unusual location for an office. The main reason NextMark is in Edmond is because we have a great team there. They joined NextMark along with our 2008 acquisition of Marketing Information Network. These Market Intelligence Specialists are the brains and the brawn that creates the data cards you find our Mailing List Finder and Digital Advertising Directory. They’ve decades of experience gathering, standardizing, cataloging, and curating information about advertising programs in all kinds of media channels – we currently support 18 media channels ranging from trusty old postal mail to the latest digital advertising channels. Their experience shows in the accuracy and comprehensiveness of more than 125,000 listings in NextMark’s directories. Another reason is the great business environment in Edmond. 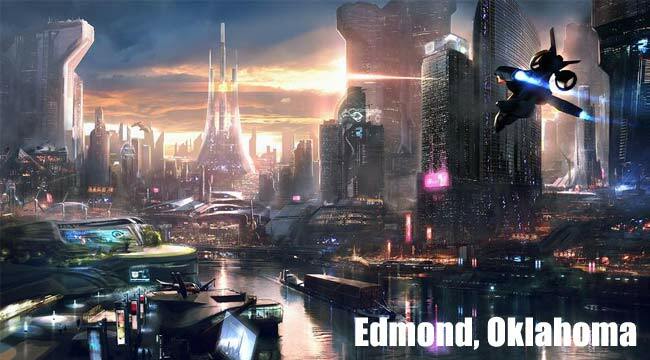 We’re not the only ones that think so: Google last week recognized Edmond, Oklahoma as the 2013 eCity of Oklahoma for being the strongest online business community in the state. Edmond is one of a select few cities in the U.S. that won this award. Congratulations to the city and all the businesses in Edmond for being recognized for what we already knew: it’s great to be in Edmond! It’s a tremendous honor to get this nomination because it comes from people who really know the business: highly respected industry veterans in the iMedia community who’ve seen just about everything and are experts in running digital advertising agencies. For them to select NextMark out of the hundreds of new technologies recently developed is a huge validation of the products we’ve been building to streamline digital media planning workflow. It’s also a huge validation of the fantastic advice we’ve been getting from our development partner agencies! 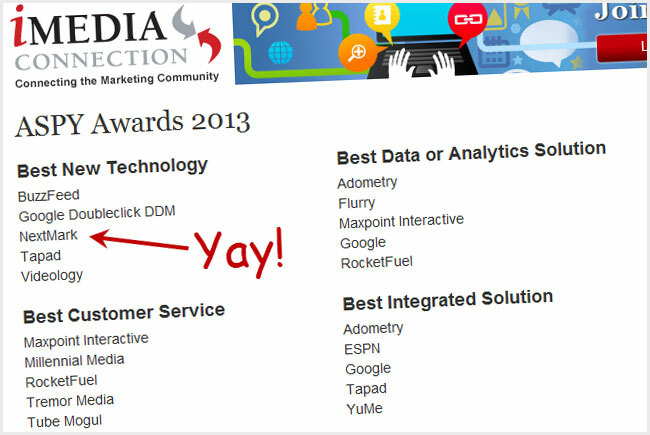 The winner will be announced on May 7th at the iMedia Agency Summit in Austin, Texas. Why is automation important to digital media directors? I presented our research that shows it costs more than $40k to create and execute a digital media plan and that executing a digital media plan involves a 42-step process. This process seems so ripe for automation with the high cost and labor. However, the Media Planning Tools Survey show of hands survey overwhelmingly concluded that Excel is still the top choice among media pros (as I’ve previously blogged). No surprise there… thankfully, because the rest of my presentation depended on that! Despite the volume of screen shot slides in the presentation, I did rapid-fire 8-minute flyover of our newest creation: the Digital Media Planner system. We just launched it two days ago. This is the first time I’ve shown it off in public. I thought the iMedia Agency Summit was the perfect venue for the reveal since it is designed specifically for media planners at independent agencies. We structured our development timeline to launch in time for the conference.As always, our fantastic development team hit their dates (we’re big on shipping on time). Being the first public reveal of the Digital Media Planner, I was afraid nervous nobody would like it. But based on a show of hands survey, virtually everyone did like it. Yay! So, that gave my ego a big boost (although maybe they were just being nice to me because I bought them all breakfast). 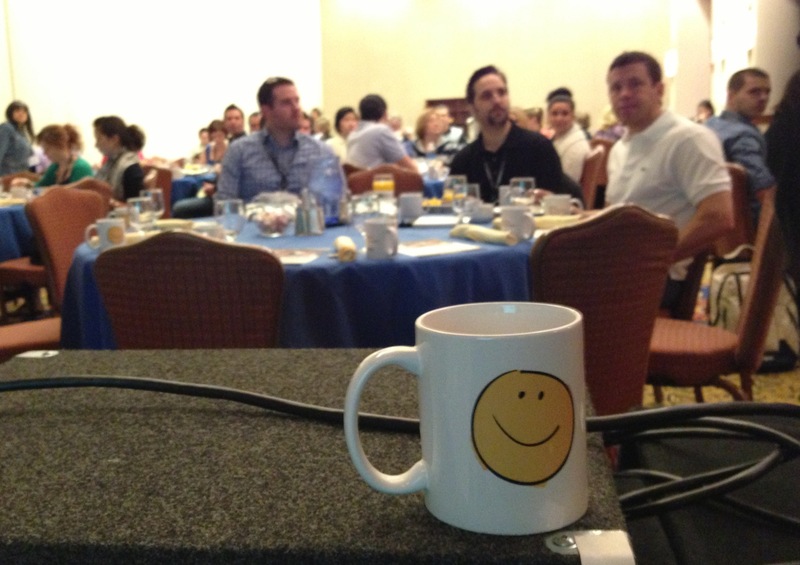 Besides the free food, everyone at the breakfast got a free limited-edition coffee mug, hand-crafted by me. I created the smiley face image by hand using one of my favorite apps on my iPad – Paper by FiftyThree. Below is a picture of the mug as the group was filing in. It says “digital media planner happiness project” on the other side just like on the title slide of the presentation. Let me know if you want one of these mugs – I made 200 and there will be some left over. Now it’s time to get outside and enjoy the warm, sunny day here in Scottsdale. Speaking of happiness, I’m very happy they hold these conferences at such beautiful places! Posted in Digital Media Planner, Happy Customers, Media Buying, Media Planning, Online Display Advertising, Shameless Self Promotion | Comments Off on Why is automation important to digital media directors? NextMark has hit yet another milestone with the Digital Media Advertising Index: more than 5,000 of the top digital media advertising programs are now represented via data cards. It was just four months ago that we hit the 2,500 record milestone. Great momentum! Those are the types of questions that are answered on NextMark’s data cards. Data cards have been used by media planners for years in other traditional media channels through SRDS, NextMark, and others. However, it’s been effectively absent from digital media. NextMark is trailblazing this initiative by adapting and evolving the data card concept for digital media. The goal of the index is simple: to make it easier for media planners to find, compare, and buy digital media advertising programs. 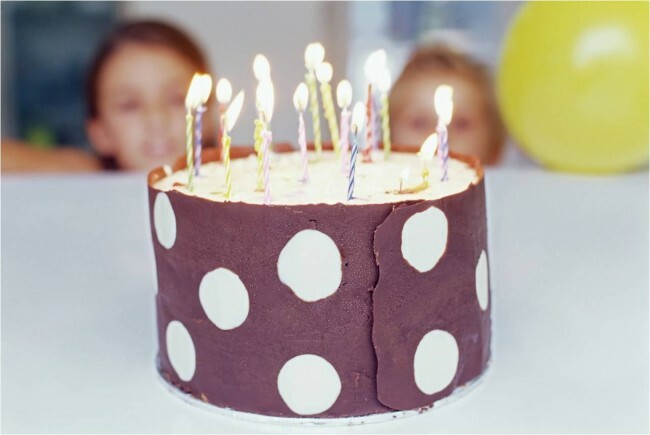 Posted in Innovations, Media Planning, Shameless Self Promotion | Comments Off on Happy 12th birthday, NextMark! The 1,000 site milestone seemed like a big deal when we hit it last month. But now it seems so yesterday… today we hit another milestone: more than 2,500 sites are now represented in our data card index. Congratulations to the Accounts and Market Intelligences teams for establishing the relationships and doing the research and data entry to hit this goal ahead of schedule. We’re running at a pace of more than 200 sites per day so it won’t be long before we hit our next milestone: 10,000 sites. 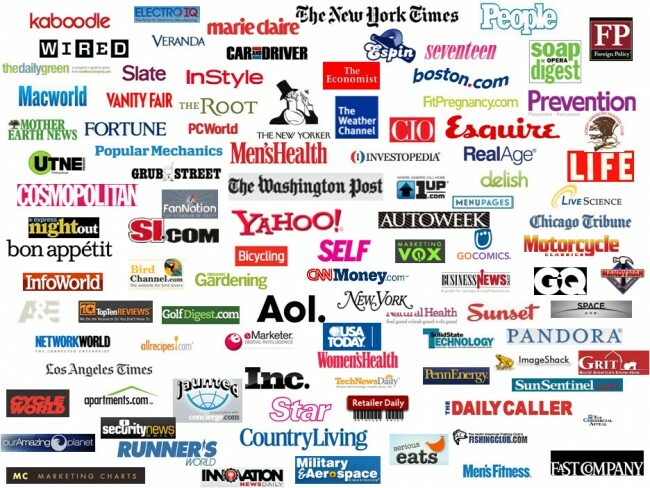 1) That “50” number is already old news; more than 100 publishers are now on board. 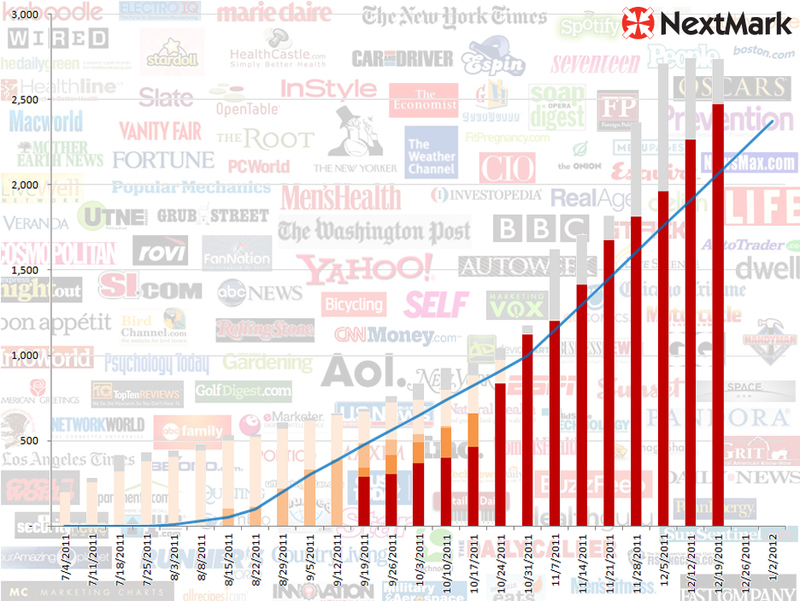 In the past month alone, another 50+ web publishers have signed on, bringing the count to 107. At the current rate, more than 2,500 of the top website advertising programs will be indexed and available by the end of the year. Unlike in other media channels, digital media planners have never had a “go to” source of comprehensive information about digital advertising programs. They’ve used myriad tools and countless hours of drudgery to cobble together the information they need to present a professional media plan to their client, the advertiser. Sure, media planners have long had good tools like comScore and Nielsen to get site metrics such as visitors, page views, and audience profiles. However, site metrics only provide a fraction of the information needed to produce a solid media plan. 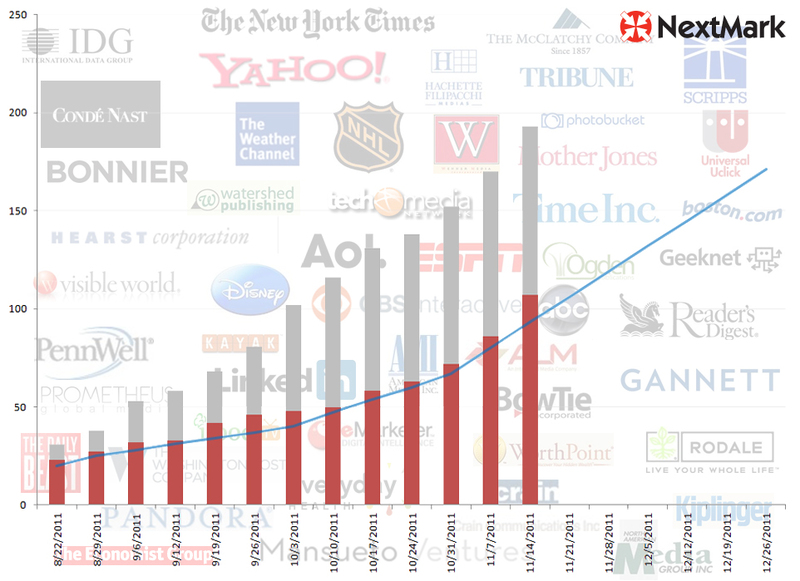 Furthermore, site metrics tools are typically disconnected from the media planning system. As a result, media planners waste a great deal of time tracking down the information they need for their media plan. Did you know that it takes more than 480 hours and costs an agency more than $40,000 to create and execute a media plan? Ouch. With access to a data card database, a digital media planner gains access to all the information they need to make decisions and to create their media plan. Their life just got a lot better: no more late nights tracking down publisher details and pasting into other systems like Excel and Powerpoint. It’s all available at their fingertips in their media planning system. Now, they can spend more time on publisher relations, strategy, and other high-value activities. Ad sales representatives from web publishers also gain an advantage by publishing data cards. By making it easy for the media planner to buy from them, they get an increase in sales leads… and those leads are better qualified. So, they waste less time servicing cold leads and more time closing deals. A prerequisite to a viable data card database is creating data cards for each and every advertising program. Nobody has ever done this before for digital ad programs. This is a monumental task requiring thousands of phone calls, tons of research, and many person-years of data entry. Basically, it means scaling up the research from a few sites on a single media plan to the tens of thousands of sites that sell guaranteed inventory on all media plans. And, because the market is in constant flux, this sisyphean work never ends. NextMark is up for this challenge. We’ve done this before. We’ve published and maintain more than 110,000 data cards for other media channels. We are now taking a page out of our playbook and adapting our technology and methods to digital media channels: online display, mobile display, and online video. 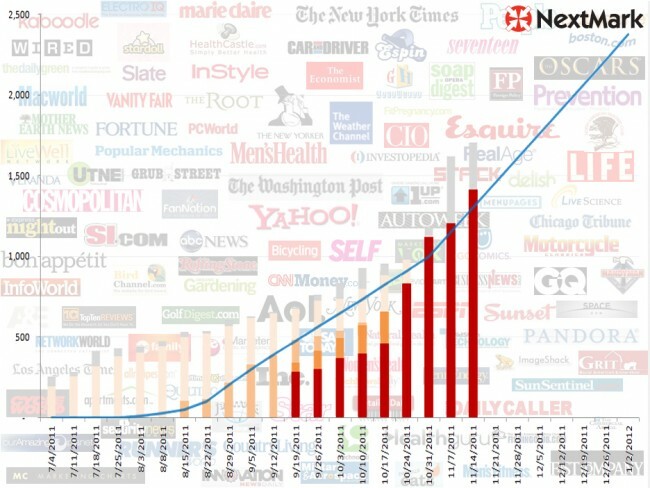 We’re just getting started, but this early progress is a good indication of the value that data cards bring to both media planners and publishers. Data cards are basically a “media kit on steroids.” It’s a fresh concept for digital media adapted from a proven method in offline media. It’s a better way to connect with media planners: data cards make it easy for them to discover your media programs and to include them in their media plans. Don’t miss your chance to gain a first mover advantage… learn more on the data card publisher page. Some great companies in the running and the competition is sure to be fierce. Please wish us luck in the finals! If you are going to the DMA09 conference, please stop by our booth #1930 to say hello.